4.4 out of 5 based on 92 bloggers and 16 commenters. 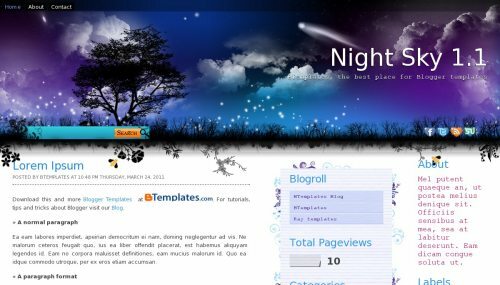 Night Sky is a free blogger template with 3 columns, right sidebar, an exclusive design for Blogger and vectorial elements. Excellent template for blogs about art, fantasy or nature. I really like the header. hola! bueno al verdad me gusta mucho esta plantilla n.n pero me preguntaba si se podria cambiar la imagen que aparece al principio. me gustara que respondieran a mi pregunta. Muy buenas, modifique la skin y me quedo perfecto, gracias. Pero no se como se pueden cambiar los enlaces a los que redireccionan los corazones, de twitter, facebook,… le agradeceria mucho la solución. This is gorgeous–any chance of a WordPress version? I’m setting up a WP site (not just a blog) and I definitely want a night sky theme. I’d love an adapted version, or even just the header! Thanks, Claudia–took a little digging, but I found it! Adorei o template, mas os seguidores não aparecem na página do blog. Como faço para por o facebook do blog? O share twitter, facebook, não aparecem depois das postagens. O que faço. I loved the template, but the followers do not appear on the blog page. How do I blog on facebook? The share twitter, facebook, do not appear after the posts. What do I do. How do I get rid of the pre instlled social icons or make them work? Also why does the GFC widget not show up? How do I reduce the gap between each post? I love it. I didn’t have to adjust anything, very awesome :) thank you! An update – I do love this, but the share buttons do not appear under the posts. Only the email button appears. Is there somewhere in the html where I can fix this? This is important to me to be able to share content – otherwise fantastic. thank u 4 beautiful template. Template is fantastic, but i need these share buttons for facebook and twitter under my posts. Can you help me create HTML for German Website?